Vince Dauro | CALEA® | The Commission on Accreditation for Law Enforcement Agencies, Inc.
Vince started his law enforcement career in 1978 with the Oxford, MS Police Department. He returned home and joined the Huntsville (AL) Police Department in 1982, and continued there for over 31 years. 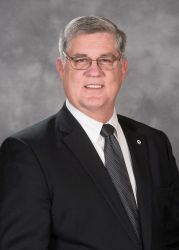 During his tenure with Huntsville he worked in all areas of the agency, retiring as the senior Captain with the department. He has worked with accreditation since 1998, serving as an accreditation manager for Huntsville PD and as an assessment team leader for CALEA. He is a graduate of the FBI National Academy and lives and works from his home in the Huntsville area. Vince joined CALEA in June of 2013 and currently serves as the Regional Program Manager for the Southeast and Caribbean regions.